The best part is that these beauties set me back a grand total of $15. They’re Nine West, blue suede boots. Swoon. 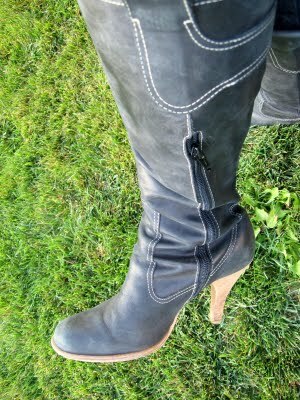 It’s hard for me to find a pair of Nine West shoes I don’t love. Nine times out of ten when I’m shoe shopping and I pick up a cute pair of shoes I love? Nine West. Do you have a designer like that? 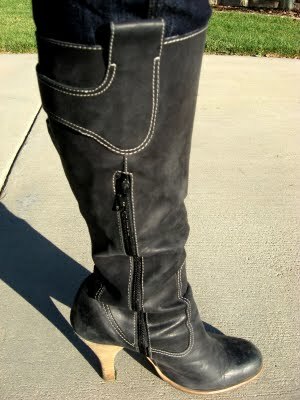 I’m so in love with these boots I’m finding excuses to wear them around the house. To do laundry. I always did want a pair of blue suede shoes. << easy decorations for fall. I know $15 right?!! I have never been so happy with a thrift store find. Love those! You're what, twelve feet tall in those heels?! Foxy mama. I found a pair of unworn Marc Jacobs boots for $10 at a thrift store here. In my size. And they're made of denim. Of course I bought them but I have yet to wear them in public. Because they're denim. Not sure I can pull that one off but I couldn't pass up the deal. Oh that makes my heart stand still. Do tell, what was the original price, it's killing me! I am about 12' in these boots, so it's a good thing Viktor is a big guy. Yes, I have a designer like that: Crocs!! Ha! But I love those boots! I think I need a pair this winter. Help me find some! I'm a size 6 1/2!! Crocs, ha ha ha. You're an easy size to find, I'll totally help you. P.S. You're the same size as P. Food for thought.